There is a misconception regarding Harold Becker’s “The Boost”, which was released in 1988 and would become known as “the drug movie”, and that is that the main character becomes messed-up once he gets hooked on drugs. Well, drugs don’t come into play until after the thirty minute mark and it’s obvious before then that the insecure and unstable man we are watching is already messed-up. 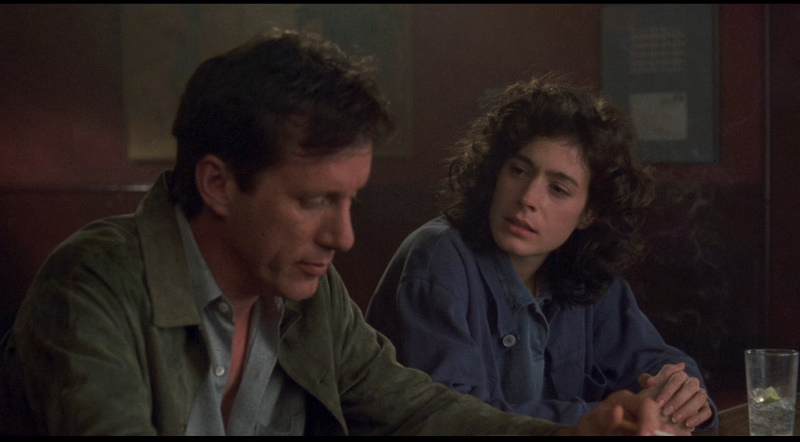 He’s played by James Woods, who excels at portraying frazzled characters who are a couple bad decisions away from blowing a gasket and endangering himself and everyone around him. Here is a movie that is certainly dated, but not necessarily in a bad way as it serves as a reminder of the hedonism that epitomized a decade of excess. “The Boost” starts off in New York City of the late 80s, where Lenny Brown (Woods) an eager salesman is seen hustling Ned (John Rothman), a Wall Street Journal writer he mistakes for someone else – or does he? The charismatic Lenny convinces the single bachelor to join him and his one-time ballet dancer-current- paralegal wife, Linda (Sean Young) for dinner that same day. What is it that makes Ned say “yes”? Indeed, there’s something convincing about Lenny that makes people say “yes” or at least go along with him. Yet, there’s almost something unsettling about the guy. Hang with him long enough and it seems as it he’s about to erupt – of course, he’ll blame it on the wine, but there’s a wounded and hurting ego underneath his confident exterior – obvious to both viewers and his supportive wife. 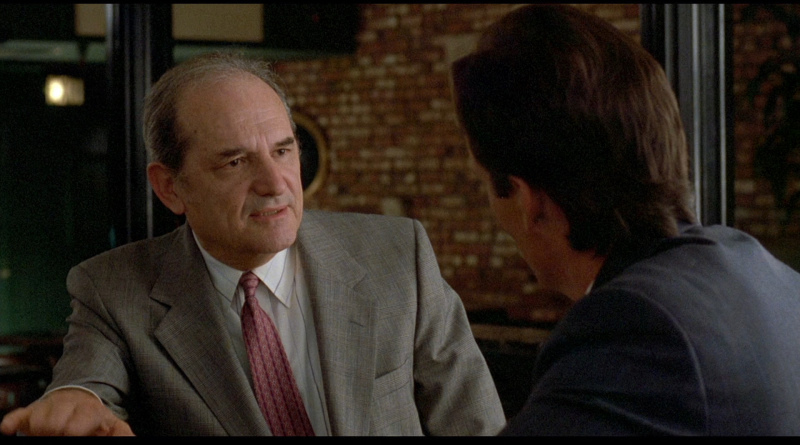 Lenny falls on his face after an enthusiastic sales pitch, but is encouraged by investor, Max Sherman (Steven Hill, long before “Law & Order”), to come work for him in Southern California, selling lucrative investments for tax shelters in real estate. To feel believed in is everything for Lenny and soon, he and a hesitant Linda, migrate to California, where they are treated to the good life – a limo from the airport leads to a house with a pool in the Hollywood hills. Max and Lenny develop a master/apprentice relationship (we can safely assume something lacking in Lenny’s life), which results in Lenny becoming a key player in the success of Max’s business. We expect the character of Max Sherman to eventually reveal some kind of nefarious side (Gordon Gekko from “Wall Street”, released the previous year, comes to mind), but for a change, he turns out to be a man who sees talent and wants to encourage it, steer Lenny in the right direction and, in turn, make a profit off him. A year goes by and Lenny and Linda are living large with two fancy cars, nice clothes and fancy restaurants. They enjoy that is until news spreads of a change in tax laws that finds Lenny’s work screeching to a halt. With his clients either hanging up on him or not returning his calls, Lenny panics and winds up taking his first snort of cocaine from his easy-going friend, Joel Miller (John Kapelos, “The Breakfast Club”), in order to…you know, help him relax. Of course, we know such an introduction is the beginning of the end for Lenny, who immediately becomes hooked on the white lines and gets Linda in on it as well. The couple spend more and more time with Joel and his acidic wife, Rochelle (Kelle Kerr), which only furthers their reliance on coke or downers or ludes, anything that keeps them from the reality of decisions. The deeper they slide into their downward spiral, the more everything they’ve enjoyed around them disappears – they go from their hilltop house to an L.A. apartment. They do spend a short-lived dry spell living on a modest apartment on the beach where Lenny sells surf boards at a nearby shop, but his humiliation and restlessness and they soon hit an even lower low than the rock bottom they were trying to crawl out of. The great moments in “The Boost” are subtle and all of them belong to James Woods, an actor who excels at portraying characters with volatile energy and a short fuse, but there’s a manic quality about Lenny that’s both funny and unnerving to watch. One of them can be found early on in the movie, after Lenny convinces Ned to join him for dinner, he leaves him on the street, saying ”I have to catch a cab,” then walks directly down the steps to the subway. This is telling of Lenny’s behavior – he says something he means to say, but never follows through or forgets it immediately after he says it. He can’t help himself because he doesn’t see it and Woods nails this about pre-addict Lenny, which leads to the drugs lighting a fuse to his jittery, ADHD disposition. It’s hard to feel for Lenny due to his eventual abusive behavior, but there’s a desperation in Wood’s eyes every step of the way that’s hard to resist. Regardless of how many times Woods tries to get back up on his feet, you know he’s gonna fail, since he’s his own worst enemy. It’s too bad, because like many addicts he was already messed up before the drugs, even though he’d never admit it. As for Young, she’s an actress who, outside of “Blade Runner” and “No Way Out”, hasn’t ever really done anything that really stood out to me (although her comedic turn in the first “Ace Ventura” was fun). But she sure is committed to her role her, even if much of it is responding to Woods’ outbursts. Although her character becomes addicted as well, she seems more like a captive than an appreciated partner/lover, that’s mostly because Woods’ Lenny is consumed with himself – and the two establish this right away in the dinner scene with Ned. Unfortunately, the character of Linda winds up relegated to the role of battered wife. Like so many wives who stick with their addict husbands in these kind of movies (and in real life), I had a hard time believing that Linda would subject herself to his destructive behavior over and over again – but then again, they loved each other and love is blind, right? “The Boost” also stars Marc Poppel as a screenwriter moonlighting as a dealer, Amanda Blake as a failed starlet who knows a thing or two about downers and Grace Zabriske (who would show up the next year in “Drugstore Cowboy) as a dog lover Lenny meets. I suppose credit could be given to screenwriter Darryl Ponicsan (who also wrote the screenplays for Becker’s “Taps” and “Vision Quest”) for the material he provides Woods, but the overall story line hits familiar Movie of the Week beats that were rampant in the 80s. The cast make the most of the dialogue provided, at times falling into appropriate melodrama, but predominately offering characterization that feels quite natural, even if certain behavior is infuriating to watch. I found it absolutely odd and funny when I learned that Ponicsan’s screenplay is actually an adaptation of a 1982 novel by Ben Stein entitled Ludes: A Ballad of the Drug & the Dream. That’s right, none other than “Bueller? Bueller?” Ben Stein, lawyer-turned-screenwriter/actor and host of Comedy Central’s “Win Ben Stein’s Money” (1997-2003). ”The Boost” was directed by Harold Becker, who gave us a slight comeback for Al Pacino the following year with 1989’s neo-noir “Sea of Love” and his last offering was 2001’s “Domestic Disturbance”, starring John Travolta. Nothing since for the now 87 year-old. What Becker gets right is the decadent southern California culture of the late 80s. It’s a fitting setting for a study of the psychological and emotional effects of addiction. “The Boost” came out the same year another addiction movie was released, the highly recommended “Clean and Sober”, which featuring a powerful dramatic performance from Michael Keaton that was post-Beetlejuice and pre-Batman. It’s a subtler, more emotional and less hysterical look at addiction, but “The Boost” is just as accurate in depicting the grip of addiction and it shouldn’t be dismissed as “just another 80s drug movie”. The movie finally comes to blu-ray courtesy of Olive Films with no special features, tiny mirror or razor blade – nothing but “The Boost”. That’s unfortunate, since the movie could use a retrospective feature or commentary to “boost” the overall viewing experience.